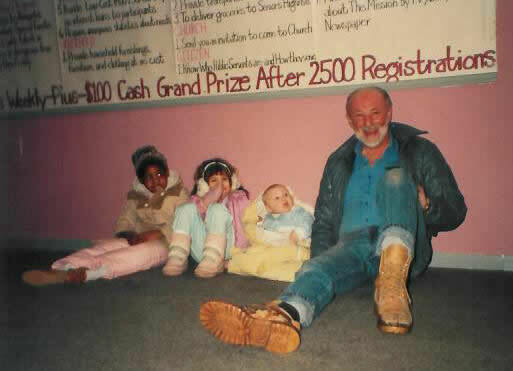 Back in 1986 Pastor Paul's Mission was in full swing with many programs designed to meet the needs of people who were just getting by on limited incomes. Today those programs are here in the form of Historic Programs. Pastor Paul's Mission was well known for these Historic Programs most of which consisted of 'Free Food GiveAways'. More than 30 years later Pastor Paul's Mission hopes to reconnect with friends online here at pastorpaul.org. Some friends who are already registered may have a limited income and want to become a VIP Club Member while others are contributors and want to donate VIP Club Merchandise. We hope to connect communities. Take a closer look at the picture above and you will see a very relaxed group that includes two children, a baby and Pastor Paul sitting on the floor taking a much needed break. The children and baby are waiting for their Mom who is shopping in the 'Clothing Closet' for free clothes. They are very interested in Pastor Paul who joined them on the floor taking a break from another day of hard work! What happened...?Pastor Paul's Mission continued to register households for the free Grocery Shelf, well beyond 2,500 households to at last count in April 2012 was 18,866 households! Within pastorpaul.org you will find original pictures and information describing how Pastor Paul's Mission has served the community since 1980 by many outstanding programs. Because huge quantities of food were handled to a growing number of households year after year, the existing programs were not expanded and no new programs were established. The Grocery Registration mural was taken down and many of the programs ended due to their success! Yet, the idea to connect people to products and services they need always remained. Our hope today is ...To reconnect with friends, provide products and connection to services that will fulfill needs. We want to be the SuperConnector! Top-Pastor Paul a Kid at Heart in the Clothing Closet with Colleagues- Pastor Paul with colleagues (children) pose for a picture in the Clothing Closet taken in 1985. The wall in the background describes our first attempt to register 2,500 Grocery Shelf participants with an eight page form explaining the need to use the eight page form. The basic form is still used today reduced to 6 pages. The information collected is used to help assess future needs of the client. 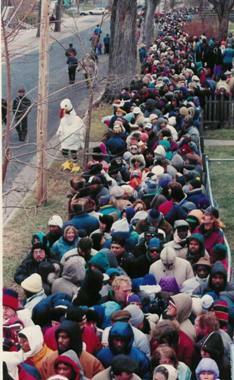 Above-One of the First Pastor Paul's Thanksgiving GiveAways in 1985-Pastor Paul moved grocery bags in position to give to people coming inside the building and down the stairs. 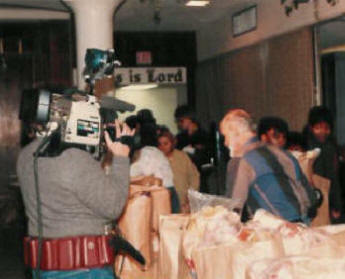 Many volunteers helped distribute food during the Thanksgiving GiveAway in 1985 as camera's roll.